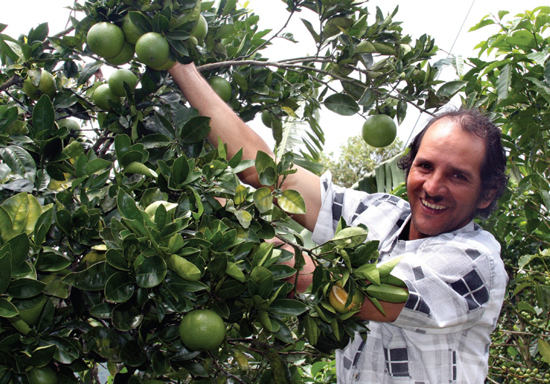 Farmer harvesting oranges from his shade-grown coffee farm in Costa Rica. April is Earth Month. It’s the perfect occasion to brush up on your recycling and composting, plant a tree, ride your bike, and replace your light bulbs with the spiral-shaped energy-efficient ones. Here’s some good news: You can also add stocking up on Fair Trade Certified products to that list. You might already be familiar with how Fair Trade helps improve farmers’ lives, but did you know about the environmental standards and benefits that Fair Trade brings to farming communities? Farmers who struggle to make a living are often forced to engage in agricultural practices that compromise their land and surrounding ecosystems. Fair Trade ensures that farmers follow strict environmental standards, and that these efforts are supported by financial incentives and resources for organic conversion, reforestation, water conservation and environmental education. This result: Delicious Fair Trade Certified products that are better for the people who grow them and better for the planet, too! Fair Trade and organic certifications are complementary and both show a profound commitment by farmers to environmental responsibility. While Fair Trade Certification does not require organic certification, it does support organic farming with training for producers and a higher price incentive for organic products. In fact, many producers invest their Fair Trade premium funds in organic certification, which has led to outstanding results: over half (62 percent) of all Fair Trade imports into the United States are also organic, and 52 percent of all Fair Trade producer organizations world-wide hold organic certificates. Ultimately, reaching for these standards encourages the production of goods that benefit you, farming communities and the earth. CoopeTarrazú is a coffee farming cooperative located in the central mountains of San Marcos de Tarrazú, which is perhaps the most famous coffee-growing region in Costa Rica. 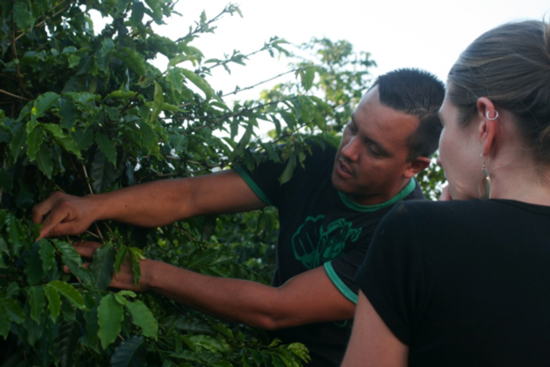 In 2006, CoopeTarrazú established the Coffee Culture Quality of Life Sustainability Plan to track their environmental impact, implement better practices, and create a culture of environmental respect among members and children. Using the Fair Trade premium, CoopeTarrazú has developed a program that provides trainings, capacity building, and environmental leadership to its members. The key to their program is their focus on raising awareness of ecosystems through a strong educational curriculum for both adults and children. Associação dos Costas is an association of small-scale coffee farmers located in the state of Minas Gerais in southeastern Brazil. Thanks to Fair Trade, Asscostas has developed an Environmental Impact Management project, which is an investigative assessment of the sustainable use, storage and control of agrochemicals on their Brazilian farms. The project resulted in the reduction of glyphosate use, incentives for the rational use of fertilizers and soil remediation, a complete overhaul of chemical storage, increased monitoring of crops, recycling campaigns for the return of empty containers of chemicals and the implementation of land conservation initiatives. Within two years of implementing the project, the coffee farmers of the Cooperativa Dos Produtores de Café Especial de Boa Esperança Ltda are now using more sustainable inputs and techniques in almost all of their production. ANAPQUI or the Asociacion Nacional de Productores de Quinua was formed in 1983 as an association of small farmers organized to sell and market quinoa collectively. 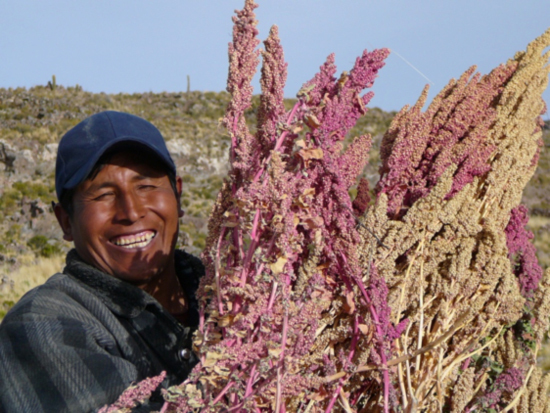 The group's stated mission is to improve the living standard of quinoa producers of the Bolivian Highlands. The group focuses on promoting traditional techniques and technologies throughout the entire quinoa production chain in order to empower farmers to sustain the environment and to grow high-quality quinoa for international markets. The cooperative places a major priority on reversing the negative ecological impacts of agricultural production. Fair Trade has enabled ANAPQUI's leadership to develop and implement a plan to prevent soil erosion, promote soil productivity and recuperate natural vegetation that has been depleted over the years. The cooperative became Fair Trade Certified in 2005 and organic certified in 1998. Make Earth Month just a little bit greener this year and help spread the word about the positive environmental impact that Fair Trade is having on you, farming communities, and the earth. Find Earth Month graphics for your blog or social media site here.